Who says tablet marketing isn't any fun? 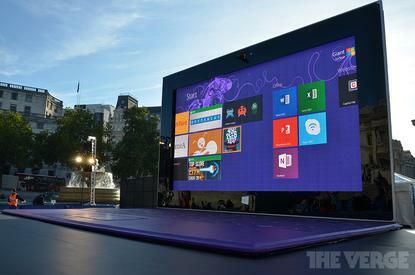 The latest advertising spectacle in that arena, according to The Verge, is a gigantic Surface in London's Trafalgar Square, with a roughly 383-inch display. Visitors can walk up to the oversized Surface and stomp on the attached jumbo keyboard to interact with apps. It's all powered by an actual Surface 2, connected via USB and Micro-HDMI. The original Surface Pro now has a second US$100 discount off its original pricing of US$899 and up. If you're in the United States or Canada, you can now snag a 64GB Surface Pro for US$699 or a 128GB model for US$799. Keep in mind that the Surface Pro 2 offers much better battery life than the original Surface Pro--75 percent, Microsoft promises--and it's slightly more powerful thanks to Intel's 4th-generation Core i5 processor. As with the Windows RT-based Surface 2, the Pro 2 also includes a two-stage kickstand that makes the device easier to use in your lap. Microsoft is downplaying the deal on the original Surface Pro, as it's not even being advertised on the Surface landing page. But, as "Jumbo Surface" in London shows, the company isn't holding back on marketing for its newer devices and the original Surface RT (now simply dubbed "Surface").